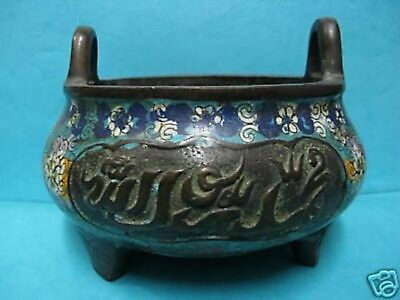 Seller: mbalwan (3,521) 100%, Location: Burlington, Massachusetts, Ships to: Worldwide, Item: 163596606371 Rare, Beautiful, Chinese Bronze Cloisonné Incense Burners, with Islamic Phrase. 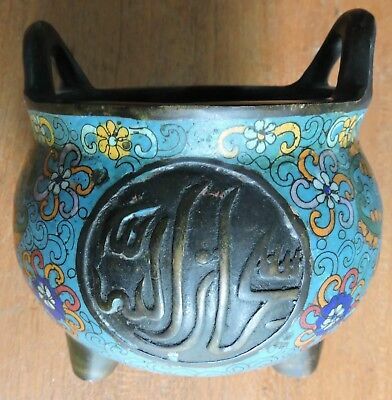 The present Chinese bronze incense burner is made specifically for export to the Islamic world. The Chinese knew that Muslims use incense quite a lot. 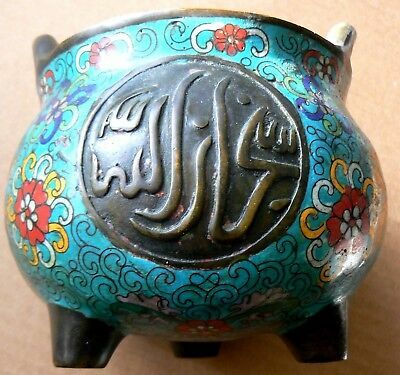 So, they made incense burners acceptable by them by carving Islamic phrases unto the Censers to promote their sale. The usual phrases are written in the Chinses style of Arabic calligraphy. It is well known fact that the Chinese use brushes and not reeds in their calligraphy. Therefore, the script, employed in this way, will have flowy strokes to it as can be seen in the pictures. Here, on both sides, the Arabic script reads: سبحان الله (Praise be to God). I have been an avid collector of such objects all my life. Size: Height 13.3 cm, Width 14 cm, Length 14.cm. It weighs: 3 pounds and 4 ounces. The sensor is highly decorated in colorful floral arabesque design. It is an elegant and artistically designed piece, heavy but very pleasing to the eye. Probably from the eighteenth century. Cloisonné, a French word meaning "enclosed", is a metal-working technique. It is an ancient technique for decorating metalwork objects. The resulting objects can also be called cloisonné. The decoration is formed by first adding compartments or cells to the metal object. This is done by soldering or sticking silver or gold wires or thin strips placed on edge. These are visible in the finished piece, separating the different compartments. Colored enamel is the usual filling for the cells. Cloisonné enamel objects are worked on with enamel powder made into a paste, which then is fired in a kiln. In older times inlays of cut gemstones were often used. The technique was in ancient times mostly used for jewelry and small fittings for clothes, weapons or similar small objects. By the 14th century this enamel technique had spread to China, where it was soon used for much larger vessels such as bowls and vases. The technique has been perfected and became common in China to the present day. Cloisonné enamel objects using Chinese-derived styles were produced in the West from the 18th century. [code:C3] Bids by buyers with 0 feedback will not be accepted. Buyer may return any item for any reason within one week of receipt, if not satisfied. International shipping costs will depend on the buyer's preference. Insurance on all shipments is an additional charge and depends on the amount of insurance desired.